Changing point of sale software is tough, but our omnichannel POS benefits are worth it. In choosing the right partner, you gain the tools to respond quickly to retail's rapid changes. Grow confidently and compete like a retail giant; we'll be right there by your side. Built for retail, by retailers. Partner with people who live retail and love technology. Imagine a growing regional retailer with a dozen stores, a warehouse, and an ecommerce site, all run by a small team in Boston. This was us, knowing the advantages of POS software, but struggling with solutions (many different ones in fact) that just couldn't provide the power, performance, and flexibility we needed to grow. So, we built it ourselves, from the ground up, with the features and functionality that we know brands and retailers will demand as they forge ahead in the new era of retail. And, we'll be with them every step of the way. Yes, it performs like a champ, but it's also easy to use. We understand that not everyone's a tech wizard, and that retailers come from all walks of life. Our POS is built to be user-friendly without sacrificing performance. Save training and IT costs with a proven technology solution that solves your inventory and reporting problems while also making it easier for your front line associates to deliver exceptional experiences. But don't just take it from us. Retailer HandPicked, with 16 stores and counting, reports that their associates were up and running on the POS in an hour, as opposed to days with their previous system! You're mobile, you want your latest store data, now. We can deliver it to you, on any device, anytime, anywhere. And, if your device is not being used as a 'selling station' (not used to ring up sales) then it's free. Empower your team to dig into the data wherever they are: on a buying trip, at 11pm while creating an email campaign, or with their morning coffee. Springboard Retail is in the cloud, making your data up-to-date by the minute and readily accessible, whenever you need it. SCHEDULE A DEMO TO LEARN MORE BENEFITS OF POINT OF SALE SOFTWARE! An engine built for growth. At last, data-driven decisions that accelerate your business. There's always a place for intuition, but to grow in retail today, you need data. 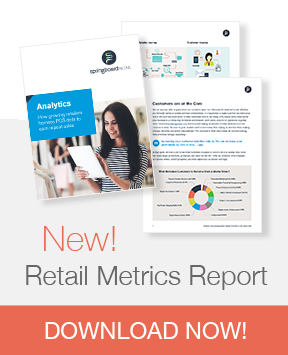 Data to drive decisions from staffing and buying to merchandising and marketing. Really get to know your business and understand what drives your customers. Capitalize on trends and act quickly when you've identified things like low sell-through, margin, and conversions. Collect the data that is meaningful to your business and report on it with any combination of metrics and filters. Get granular, dive into the data and most importantly use it to make the right decisions, ones that fuel your growth. SEE ANALYTICS TOOLS IN ACTION! Every retail business is unique, no problem. From a single store to a growing franchise with over 40 stores, Springboard Retail POS was built to accommodate retail — of any size and scale. Flexibility is built in our DNA, from our developer friendly open API to our integrations with top retail platforms, affording you a premium end-to-end solution. Scale up or down seamlessly and rest assured that your software will always be up-to-date with the latest tools. Think of us as an extension of your team, ready, willing and able to solve problems and grow with you. "Brilliant system — easy, comprehensive, flexible and pointed on target at retailers. Partnering with growing brands & retailers across North America.